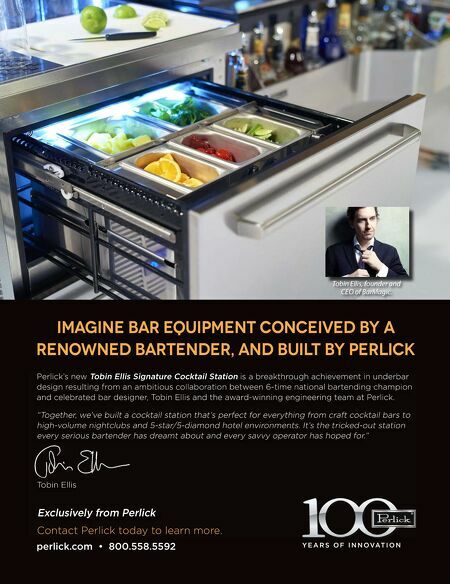 36 • FOODSERVICE EQUIPMENT & SUPPLIES • NOVEMBER 2018 2. LIGHTING "Designing kitchens these days is like set design for a theater," Grondin says. Kitchens need to be well-lit, especially open kitchens or peek-a-boo kitchens, where the intent is for customers to watch the action. After that it's all about Instagram. Diners continue to whip out their cam- eras and snap photos of dishes to post online, regardless of whether they're pro- fessional food writers. That said, lighting trends now create more of a focus on the individual plates and tabletops. "For the tables, we try to create intimate zones with spotlights directly over the tabletop to showcase the food," Grondin says. "Lighting can also be used in this way to create a more inti- mate zone so that the table next to you fades into the darkness." Natural light and plenty of windows near tables help create the perfect lighting for food photography. Operators and their supply chain part- ners need to understand these factors when curating the individual elements that will work together to create the restaurant's tabletop. 3. MIRRORS Grondin says she tries to incorporate mirrors in as many restaurant projects as she can. "Mirrors double the amount of activity in the room so there's con- stant motion and movement," she says. Mirrors can also improve service. "Your server now has views of almost the entire space and can see activity at his or her tables from a further dis- tance," Grondin says. 4. FIRE These days, it's all about †re and open ‡ames. Newer, chef-driven restaurants capitalize on a wider range of wood- †red equipment, from ‡ywheel grills where staff raise and lower the cooking surface for direct or indirect cooking to wide-open ovens stacked with logs and embers. Restaurants like José Andrés' Bazaar Meat in Las Vegas and Proxi in Chicago both have custom-designed, wood-†red grill/oven combinations on display at the center and open back kitchen, respectively. Those mirrors Grondin referenced come in handy here, too, as they capture the ‡ickering ‡ames coming off wood- †red equipment or even open-‡ame †replaces. In fact, Grondin incorporated the later into the design for The Terrace Room at The Harbor Grand resort in New Buffalo, Mich. There, she designed a narrow, open †replace-like feature along the banquettes to separate the main din- ing room from a meeting space annex. Grondin also continues to work on a design and sourcing equipment for †re pits that could cook a whole pig and more on the patio of a new restaurant in Texas. This approach would allow the operator to expand on the limited kitchen space. Diners would be able to sit on the patio around the hearth as well as view it through win- dows from inside the dining room. "There's something so magical about food and †re," Grondin says. "They create memories and get people to talk about the space and come back." 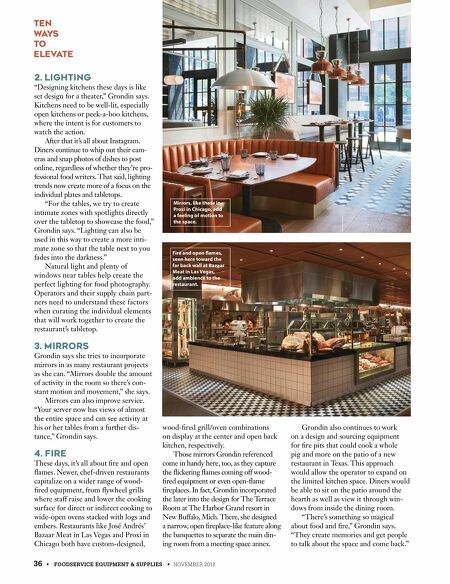 Ten Ways to Elevate Fire and open ames, seen here toward the far back wall at Bazaar Meat in Las Vegas, add ambience to the restaurant. Mirrors, like these in Proxi in Chicago, add a feeling of motion to the space.